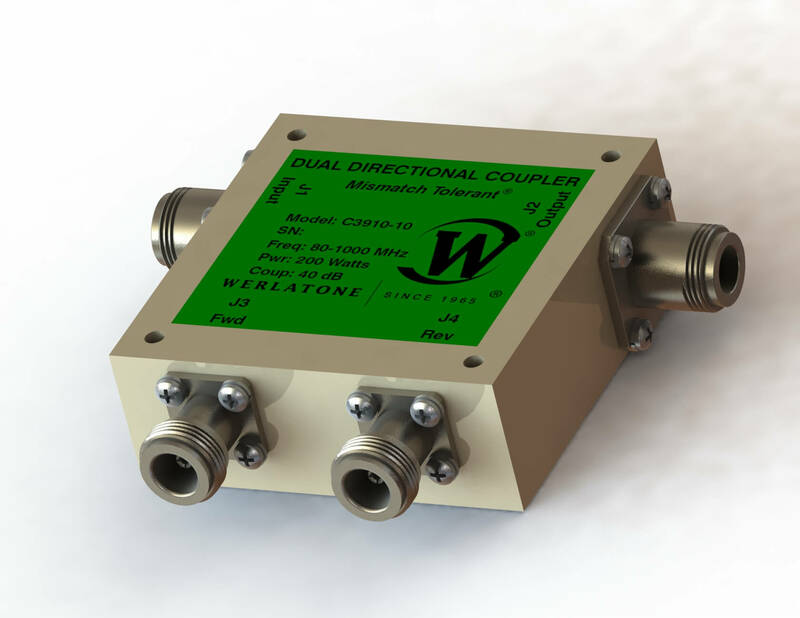 The Model C3910 is one of Werlatone's most widely used 40 dB Dual Directional Couplers. Covering the full 80-1000 MHz band and conservatively rated at 200 Watts CW, this compact design operates with minimal Insertion Loss (less than 0.2 dB) and excellent Coupling Flatness (better than ± 0.3 dB). Rated Mismatch Tolerant, the C3910 will operate continuously, at rated power, into a severe load mismatch condition. The Model C3910 is one of Werlatone’s most widely used 40 dB Dual Directional Couplers. Covering the full 80-1000 MHz band and conservatively rated at 200 Watts CW, this compact design operates with minimal Insertion Loss (less than 0.2 dB) and excellent Coupling Flatness (better than ± 0.3 dB). Rated Mismatch Tolerant, the C3910 will operate continuously, at rated power, into a severe load mismatch condition.